In 1898, the artists periodical The Studio called Christopher Dresser “perhaps the greatest of commercial designers imposing his fantasy and invention upon the ordinary output of British industry.” This seems an appropriate description for an Englishman who was interested in art but first trained in botany, and then found inspiration for his designs both in the ancient past and traditions of Japan. Looking at two of Dresser’s designs in the collection of the Milwaukee Art Museum–a pitcher produced by the Watcombe Terracotta Clay Company and a claret jug produced by Hulkin & Heath–you can see how he applied his own personal motto to his work: truth, beauty, power. The sleek and angular vessels lack the decoration that most people associate with the Victorian period, which would have been at its height in the 1870’s. They look like something from the 20th century! It may surprise you then, that Dresser was also known for his interests in flat patterning. His use of patterns was inspired by ancient cultures, particularly Egypt, which was in the height of revival in England. One source of these patterns was the architect and designer Owen Jones, one of the most influential design theorists of the 19th century. Jones’s important publication, The Grammar of Ornament, grouped patterns by culture such as Persian, Greek, Chinese, and Egyptian. Dresser was also hired a number of times as an interior designer known for his Arts & Crafts style. In fact, although much of it doesn’t survive, Dresser’s most successful work was done in wallpaper and textile designs: two examples are this fabric at the Metropolitan Museum of Art and this wallpaper in collection of the Henry Ford Museum. For a short time, he even had a workshop producing furniture. So, what’s going on here? Dresser can’t be easily pigeon-holed as proto-modern or Arts & Crafts. He would say that he is using rules of design—from many sources—to produce beautiful things for everyone. Christopher Dresser (English, 1834-1904), Manufactured by Hukin & Heath (Birmingham, England, established 1885), “Crow’s Foot” Claret Jug, designed October 3, 1878. Silver plate and glass, 9 5/16 × 6 1/2 × 4 1/4 in. (23.65 × 16.51 × 10.8 cm). Milwaukee Art Museum, Purchase, by exchange M1998.75 Photo credit: Historical Design. In fact, he readily accepted machines as a useful way to improve peoples’ lives. He felt that using machines meant that more people could be exposed to artful domestic objects. This is in direct opposition to proponents of the Arts & Crafts movement such as John Ruskin and William Morris, who believed that good design only came from hand-producing everything. Dresser believed that a functional objection is beautiful if it functions as it should. If that meant it should be simple in line, then that is what it should have. He also was found inspiration in Japanese decorative arts. He traveled to Japan and collected Japanese objects. Through his mass-produced objects, he got the Western world interested in Japanese design. He respected Japanese “breadth of treatment, simplicity of execution and boldness of design.” The interest in the visual culture of Japan would also be expressed in Victorian styles, such as the Aesthteic movement. Also, for Dresser, the cost of the material didn’t matter. The Watcombe factory in Torquay, a seaside town in Devon, was proud of their beautiful red clay and chose designs that highlighted it. The humble clay fit nicely with Dresser’s interest in simple materials and showed off the clean lines of his designs extraordinarily well–see top photo in this post. Meanwhile, the claret jug (middle photo) uses a brand-new material—silver plate—which allowed him to contrast the shiny metal with the clear glass without adding the cost of using pure silver. Dresser’s focus on the geometric comes from function and Japanese design, but it also comes from the past. 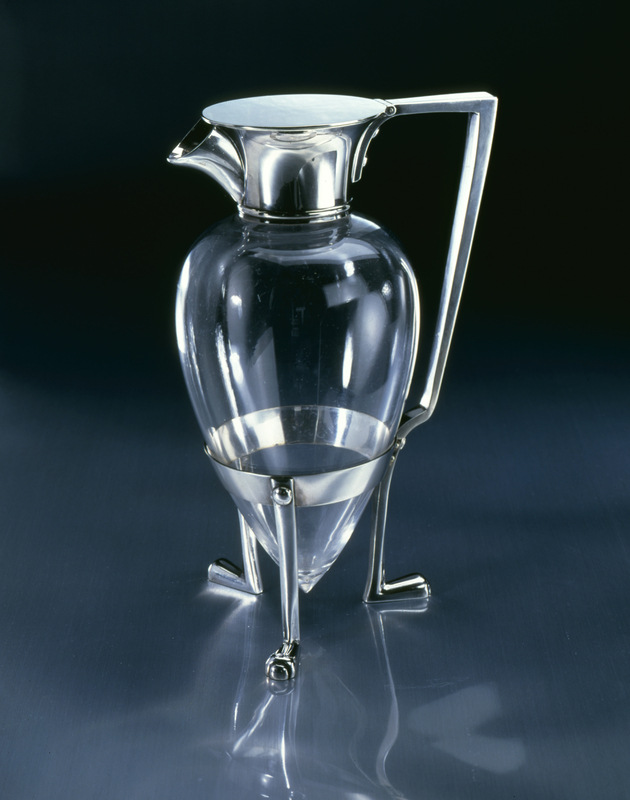 The Claret Jug uses crow’s feet for the base—commonly used in ancient metal work. The glass body has rounded shoulders and a pointed bottom, which suggests the shape of an ancient Roman amphora. Even the squared off handle is reminiscent of ancient pottery made simply and for a practical purpose. This entry was posted in Art, Curatorial and tagged christopher dresser, Decorative Arts, Design. Bookmark the permalink.